^ Quickfacts.census.gov - Holmes County Archived 2011年7月11日, at WebCite - accessed 2011-12-06. ^ American FactFinder - Millersburg, Ohio - accessed 2011-12-06. 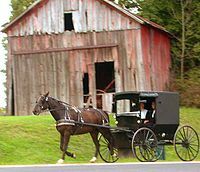 ^ a b “Fact Sheets: Holmes County and Amish Country”. Holmes County Chamber of Commerce. 2012年7月29日閲覧。 . Quote: "Approximately 36,000 Amish residents make the region the largest Amish community in the world. Centered in Holmes County, Amish Country extends into each of the surrounding five counties. The Amish community has existed in this region of Ohio since 1809."